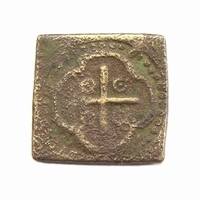 A square uniface coin weight for weighing an English gold noble. 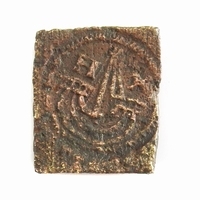 Obverse: ship with beaded circle around. During the reign of King John coin weights were first mentioned in Statutes of 1205 to be used as a 'deterrent against the passing of light or clipped coins'. Coin weights of English origin were only available for gold coins until the reign of Charles I (1625-1649). Early English coin weights were round with a design that was usually similar to the coin it represents. In the early 16th century square coin weights were introduced with the value in Roman numerals in shillings (S) or pence (D) on the reverse side. Roman numerals last appear on English coin weights under James II (1685-1688). During the reign of Queen Elizabeth (1558-1603), it was ordered that only true weights, produced by the Mint in the Tower and marked with a crowned 'E' were allowed. In 1617-1618, James I issued a similar proclamation for the provision of official balances and weights. Most of the contemporary square coin weights from James I are counterstruck with a certification mark of a crowned letter 'I'. Under Charles I, an act of Parliament banned all square coin weights. The new round weights are amongst the most common found. In the late 17th century many coin weights began to be privately made and often bear the initials of the makers or a certification mark. After 1891 the Coinage Act made the use of coin weights obsolete as the government guaranteed the value of each new coin.